Many congratulations to the Mixed Media Dance Group on their fantastic achievement in winning this year's National Urdd Eisteddfod competition. Indeed, every pupil who travelled to Boncath is to be praised for their efforts - members of the Choir, Orchestra, Creative Dance Group, Instrumental Ensemble and the individual competitors - although they not get to the stage, their performances were of a very high standard and we are very grateful to them along with everyone who spent their time coaching and preparing the pupils, for their hard work during the last few weeks. This week teachers from Europe are visiting Aberystwyth as part of the Comenius project. And this morning, we welcomed them to Ysgol Gymraeg to celebrate in a special School Assembly outlining the importance of our project and friendship. The Ysgol Gymraeg is part of a Comenius project along with our partner schools wich are from Denmark, Finland, Turkey, Ireland, Italy and Ysgol Llwyn-yr-Eos. It was a pleasure to welcome them to the school, where they visited classrooms during lessons in order to have a taste of teaching and learning practices here in Wales. Members of Year 6 had a lot of fun whilst competing in the Books Quiz. Congratulations to the nine members on winning the competition for years 5 and 6. They will now compete at national level which is held on June 21st. Team Uk Youth who will be competing in the Cycle Fest over the weekend visited the school for a question and answer session. As you can see in the photograph, they brought a bike with them to show us, a special bike worth £10,000! Wow! Team Uk Youth is the team who are currently leading the tour series. Keep an eye out for them tomorrow evening when they will be racing around Aberystwyth. Congratulations to four pupils who were successful in a competition held during the Science Exhibition at Aberystwyth University recently. Ioan, Esyllt, Sara aand Dylan shared one of the main prizes after answering questions correctly on the day. Many congratulations to the four of them. It was a pleasure to welcome Sioned Harries, a Wales Women's Rugby Player to the school to talk about her career and experiences. It was interseting to hear that when she was younger she played in a boys team because there weren't any girls team for her to play with. Sioned has won 19 caps for Wales and it was great to hear her inspiring the children to follow their dreams. We were also lucky to have Sioned at the Urdd Club where she taught the boys and girls a few key skills. Many thanks Sioned. Year 6 pupils had a very interesting and worthwhile morning in the company of Chris and Amy as they discussed racism. The children learnt a lot about racism, and are now aware of what is and what isn't acceptable when it comes to discussing skin colour, religion, nationality and culture. Congratulations Sara, Esyllt, Dylan and Jack on winning the wristbands in the quiz. And remember - 'Show racism the red card'. Many thanks to everyone who supported the Sponsored Walk this year. It was great to see so many taking part - pupils, parents, relatives, staff and past pupils all enjoying a leisurely walk along the various footpaths: along Plascrug Avenue for the little ones and to the cricket field and back for the older children. A big thank you also to Tŷ Nant for sponsoring the walk and providing us with hundreds of bottles of water for the thirsty walkers. Congratulations to the school's cross-country runners on their achievement in winning the Urdd National Cross-country competition held at Blaendolau Fields recently. They were presented with the Aberystwyth Athletic Club Shield for being the school with the most overall points scored in each race. In order to support the Geography work learnt in the classroom this term, Year 6 visited the National Botanical Gardens near Llanarthne. The aim of the trip was to learn and see an example of how to live a greener life, as the garden is very sustainable. It collects rainwater, grows willow for its own biomass boiler and treats its waste on site etc. Many thanks to Angela for guiding us around the garden, and for her interesting facts and useful information. Congratulations to one of the school's hockey teams, Mellt, on their fantastic achievement once again. A little over a month ago Mellt won the hockey league, and now they are the Cup winners ar well. The last time a team from the school were league and cup champions in the same year was fifteen years ago! Many congratulations to Mellt and the other school teams for competing so enthusiastically during the hockey season, and thank you also to the staff who have been coaching and supporting the teams throughout the season. Congratulations to the Sêr hockey team on reaching the cup final on Friday evening, 10th May. In a very close final, the team were unfortunate to lose by only one goal, having reached the final playing against excellent teams in the stage and semi-final. 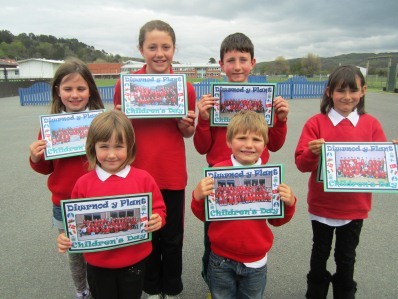 Congratulations to Year 2 pupils on winning first prize at this year's National Urdd Eisteddfod with their 3D artefact. This is the second year running Year 3 have won this competition. Congratulations to Gwenllian of Year 6 on winning the third prize in the poetry writing competition for years 5 and 6 at this year's National Urdd Eisteddfod, Pembrokeshire. The title of the poem was 'Gofod' (Space). You may remeber GWenllian winning the School Eisteddfod Chair back in February with the same poem. Well done you, Gwenllian. We hope you'll go on to win several more chairs in the future. 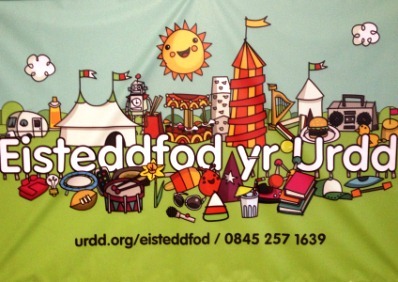 Many congratulations to Steffan of Year 2 on his fantastic achievement for prose writing at this year's National Urdd Eisteddfod. Steffan managed to come second in the prose competition for year 2 and younger. Steffan wrote a story on the theme 'Yr Allwedd Hud' (The Magic Key) Steffan's magic key took him to a car race! Well done you, Steffan, and we hope you'll continue to compete in the future. Year 5 pupils were fortunate enough to participate in a workshop with the talented illustrator Jac Jones in the National Library this week. We enjoyed looking through examples of his Various work and hearing the interesting stories behind his illustrations. We wonder if anyone from our year will be a famous illustrator like him some day? This week, six special cards to note International Children’s Day will be sent to our European partner schools, as part of the work for our Comenius project, ‘The Good Life’. International Children’s Day is meant as a day to encourage understanding between children of all nationalities and of promoting the welfare of children around the world. To note Children’s Day in Turkey - one of our partner countries - at the end of April, as well as one of the official worldwide International Children’s Day dates on June 1st, each of the project schools will send each other cards this week. Congratulations to three pupils from the school on their success in the Urdd's County Cross-Country races held in Aberaeron recently. Rhys from Year 4 and Sion from Year 6 managed to win their races, with Lisa from Year 6 finishing third in her race. Well done runners, and well done to everyone who travelled down to Aberaeron to compete in the races. Year 6 enjoyed a thoroughly educational morning at the Welsh National Assembly building in Aberystwyth recently. We listened to an introduction on the work the Welsh Assembly Members does, concentrating especially on the Prime Minister and members of his Cabinet. The pupils were given the opportunity to step into the Cabinet members' shoes by prioritising and deciding in their groups how and where they would spend the budget for Wales. Thank you especially to Sioned for leading this thoroughly interesting session with the pupils. Over the Easter holidays one of our Year 6 pupils was busy filming on the set of 'Hinterland'. Seren was chosen because of her likeness to one of the show's main characters, and will appear in a series of flashbacks whilst enjoying a picnic on the beach in Aberystwyth. We hope you had fun whilst filming, Seren, and we look forward to watching you on television during the year. Last Friday Year 3 went to visit Cwmwythig Farm which is in Capel Bangor. Luckily it was a dry and sunny day. We saw the cows being milked in the parlour which can milk forty-four cows at the same time. We also sat in the tractor, visited the calves, visited the bull and the little piglets. The best part of the visit was holding the young pups in pur hands! Many thanks to Mr a Mrs Evans and their family for welcoming us to their farm once again.